And the bad news just keeps on coming for Hervey Bay this week. An administrator has been appointed to control the affairs of the well-known tourist operator – the Fraser Island Company – and hopefully find a buyer. It’s been reported elsewhere that the Fraser Island Company owes creditors over $3 million dollars and those creditors include the Australian Tax Office and the Fraser Coast Regional Council. Undoubtedly there will be some much smaller local creditors in the mix too and that will further damage the local economy. The administrator is confident that a buyer will be found for the business but with so many Fraser Island tourists being lost to Rainbow Beach you would have to wonder whether that confidence will be rewarded. 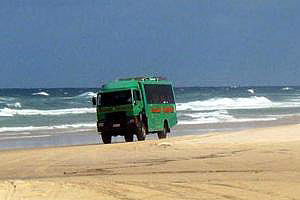 The green 4WD buses of Fraser Island Company were once a common sight around town but I haven’t seen one around for some time and now that looks as though it was a sign of what was to come. I know the bad news gets us all down, but how about also reporting some positive news like the article in the Australian about Hervey Bay last week ….. Thanks for commenting. I presume you were referring to the article in the Australian on the 28th October entitled “Battlers’ sea change prepares for take-off” – an article that was apparently based on something other than facts and doesn’t contain any good news that I can see. So let’s look at some of the claims made in the article and we’ll start with the direct flights from Melbourne that “hopefully will be in place early next year”. Angela that’s just about as delusional as you can get … there has been talk of direct flights from Melbourne for a long time now and nothing has happened because the airline companies know that direct flights from Melbourne are not economically viable. Airlines require two things before they’ll think about flying to a destination – passengers and cargo – and there’s not enough of either to justify a direct flight. We run several high-traffic websites that deal with tourism in Hervey Bay and we can tell where people who visit those sites come from and not many people from Melbourne seem interested in Hervey Bay so there’s not the demand for direct flights that some people in this town seem to believe and no airline is going to fly an empty plane from Melbourne. Then the article in the Australian talks about the $800 million Urangan Boat Harbour upgrade as going ahead. Yeah some research must have gone into that because that project was known to be dead in the water (no pun intended) before the article in the Australian appeared. The article in the Australian also mentions the Wyndham Hotel Group’s development down at Urangan. Once again there hasn’t been much research done there either because from what I hear that project was off before the sign even went up on the vacant land. The Aldershot Mine is also mentioned … I’m sure that will go ahead eventually but I wouldn’t suggest anyone hold their breath waiting for it to happen and even when it does the benefit to this region may not be half as much as some people are expecting. The new projects for EDI at Maryborough – four years worth of work for a workforce that’s already in place and few of whom live in Hervey Bay. The airport industrial estate … ah isn’t that already there and filled with vacant blocks and half-empty buildings? And as for the statement that this area saw an increase in tourism numbers last year … well I think you will find that that assertion would be contested by just about every tourism operator in town. So now you can probably see why I try to tell it like it is – Hervey Bay is struggling and no amount of fairytale journalism can change that plain and simple fact – but by telling it like it is I hope that I can encourage others to understand that what we’re being told about Hervey Bay has little resemblance to how things really are and it’s time to get off our collective bums and make an effort to get things happening for Hervey Bay. The big end of town isn’t interested and the Fraser Coast Regional Council couldn’t run a country toilet so it’s up to us … the ordinary people and the small business end of town … to make things happen and we won’t do that while we go on believing that all the pigs are fed and watered and ready to fly. If some one could get a barge and do cheaper trips to Fraser Island that would help to bring the tourists back to Hervey Bay. I think you have covered this region’s situation ver well. Many people are blaming the current council for much of our problems! Not true, they should look back over the last ten years to see who is to blame. You try new things in the good times, not the bad, you spend money when you have money to spent and conditions are good. Not when monies tight and the economy is in a slump. Poor government at all levels and public apathy created what we are now suffering. As a business owner that started in the new airport when the palnes started to roll in, we where told 6 months after the airport opened we would see direct flights from melbourne? 18 months later still nothing, after befriending an employe of a certaine company it was realised that the airlines made more moneys flying people to sydney then doing links from there, does anyone ever notice that iot cost more to fly into the bey then what it does to fly out? also we where oficaly told that direct flights to NZ would be on track within 2 years of the opening but again the airlines make more money with link flights? 1. The rediculous FCRC. These guys pushed developers out of town. They made it difficult for builders to build homes. They hiked rates to some of the highest in the country. They screamed poor while they threw money into their own pockets. These guys were a major issue. 2. False economy. I remember sitting in a seminar at the Boat Club about 2 yrs ago, listening to some ‘expert’ show off Hervey Bays projected figures. I laughed my way home afterwards. Like every small town, HB benefited from the pre-GFC madness of spending borrowed money, and then spending more of it. All this on the assumption that HB would be the ever-lasting booming economy. But the economy was like a glistening building held together with duct tape. I watched businesses go under leaving empty shops strewn along Boat Harbour Dr and land prices drop by 50% overnight. 3. Over-capitalisation. It seemed that HB was a haven for every dodgy businessman in Aust to ‘invest’ in. It was Aust’s Dubai with million dollar homes and yachts scattered along the coastline. Developers hoarded the town like ants on a picnic, with a new estate on every corner. Seriously, who pays $500k for a block of land facing a stinking, mosquito-infested swamp? But that’s what they were doing. My last investigation put those blocks at $350k, then $250k. Homes went from $400,000 to $300,000. Like a good night out with the boys, HB flaunted cash and had a good time. But now it’s time to realize that it is a cheap retirement town. If you’re happy to sit back and relax witha tinny in one hand and a fishing line in the other, then great. If you are after anything more, get the hell out.